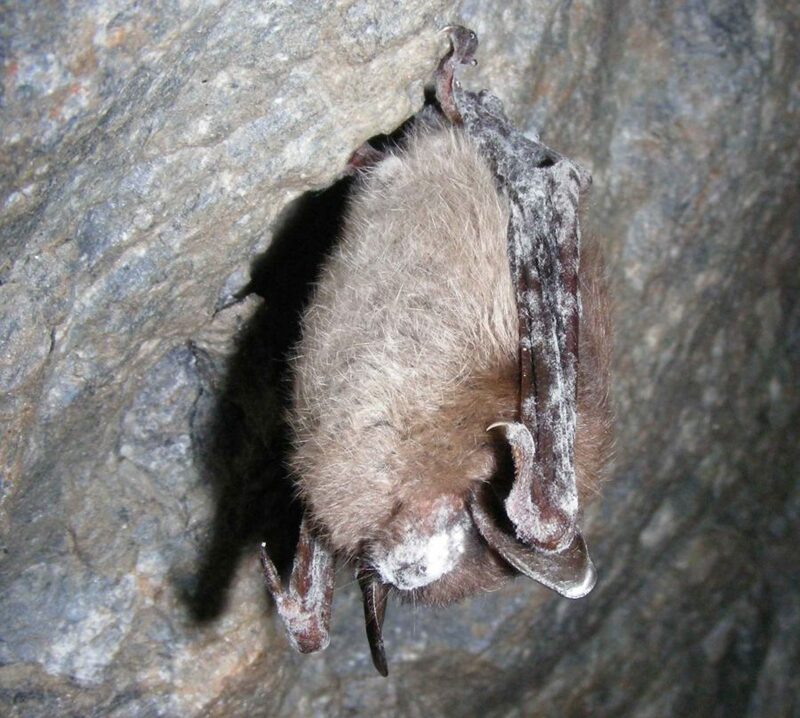 White Nose Syndrome (WNS), a fungal disease responsible for the death of millions of bats in eastern North America, has moved to the west coast and was confirmed in Washington State in 2016. The presence of this disease in the west coast is very worrisome for the health of bat populations in British Columbia, with near 100% mortality for some species of bats exposed to the fungus. Although devastating for bats, WNS does not affect humans. For more information on WNS, visit our web page www.scbats.org or the official WNS webpage www.whitenosesyndrome.org. 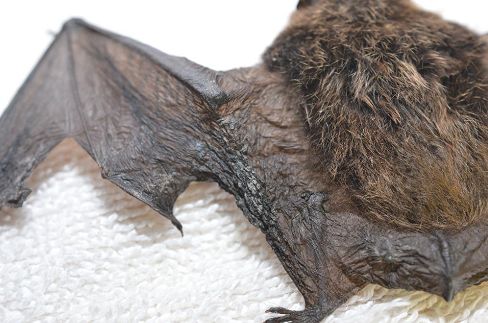 This disease is caused by a cold-loving fungus called Pseudogymnoascus destructans, and it affects bats during hibernation, where they are more susceptible to disturbance. Bats wake up more often from hibernation spending most of their energy reserves before the winter is over. The typical first sign of this disease is bats flying during the winter looking for food, an unusual sighting at a time of year when bats are hibernating. Another sign of the presence of WNS is the appearance of dead bats as they succumb to the effects of the disease. The BC Community Bat Program in collaboration with the BC government and local conservation organizations like the South Coast Bat Conservation Society (SCBats) is requesting the public’s help in monitoring the spread of this disease. We are asking for the support of the community to report dead bats and any winter activity. Dead bats will be tested for the fungus responsible for the disease and will provide an early detection of WNS if the bats are infected. Early detection of WNS in BC and reports of winter bat activity will help focus research, monitoring and protection efforts. If you find a dead bat, please contact the South Coast Bat Conservation Society at info.scbats@gmail.com or 1-855-922-2287 ext. 11 as soon as possible for further information. Please remember, you should never touch a dead bat with bare hands. If you or your pet has been in direct contact with the bat, you will need to contact your local health unit. Currently, there are no treatments for White Nose Syndrome. However, mitigating other threats to bat populations and preserving and restoring bat habitat may provide bat populations with the resilience to rebound. Here is where SCBats with the help of the general public can help. We are a non-for-profit organization, and our mandate is to improve our knowledge, generate awareness, increase stewardship and provide technical and scientific services for bat conservation. Also, funded by the Habitat Conservation Trust Foundation, the Province of BC, and the Habitat Stewardship Program, the BC Community Bat Program works with the government and others on public outreach activities, public reports of roosting bats in buildings, and our citizen-science bat monitoring program. To contact SCBats to learn more about bats in Metro Vancouver, see www.scbats.org, email info.scbats@gmail.com or call 1-855-922-2287 ext 11.